In a quiet little corner of the South Cronulla beach sits Zimzala. A hidden gem, with a glorious view, the café/restaurant looks like part of the Surf Living Saving Club from a distance. It took me a long time to come across Zimzala, but since then it has become a favourite for brunch and afternoon tea. The sea comes to you. The first few times I visited Zimzala it was for brunch. 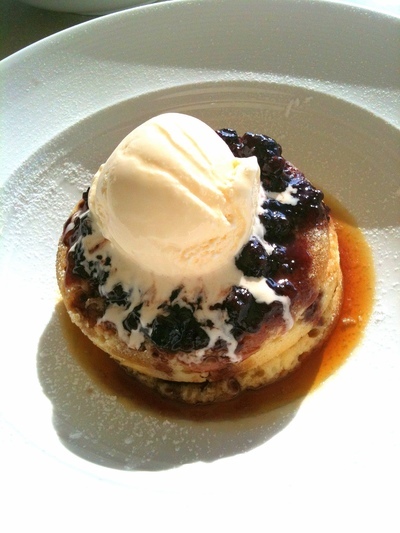 Being a pancake enthusiast, I naturally chose the buttermilk pancakes with assorted berries and maple syrup. They were a few centimetres thick and rather crumpet-like in texture on the inside. While these pancakes were delicious, if you weren't quick enough, the syrup and ice-cream would turn your fluffy pancake into mush. Additionally, this crumpet-like batter was more difficult to make, so basically once the batter had run out, that was that for the day. 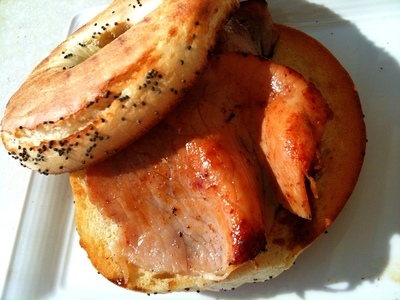 On one of the occasions when the pancakes were unavailable, I used the extras list to order a simple bagel. It was decent, yet the bagel was a bit over toasted for my liking. The menus for Zimzala are often revised and luckily these two problems were remedied, leaving patrons with soft, fluffy pancakes with berries and maple syrup. I'm not quite achin' for this bacon. I have visited this establishment a few times for afternoon tea, with their menu catering for a range of customers, rather than those who are just after a coffee and slice of cake. Frustratingly though the tasty treats here are not on display, which means asking staff each time. On my visits I have ordered a Byron Bay cookie and a fluffy muffin - which is about the extent of their small treats. You can also order desserts from their three course lunch menu, but they begin at $14. You can also buy a dessert as part of a mid-week lunch special - 2 courses for $35. Zimzala's coffee is impressive, however it is important to note that the regular size is on the small side. On more than one occasion, I have had the small coffee before the food came out and I had to order a second. If you're dropping in, I would recommend going for the large size. 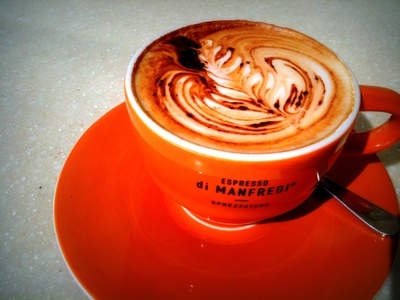 The coffee is from strong beans, with a slightly bitter after taste. The high tea at Zimzala's is also in hot demand. I have wanted to try the establishment's high tea for a long time. The chefs have put a modern Australian twist on the traditional English high tea, with petite wagyu cheeseburgers and pies, to contrast the ribbon sandwiches, scones and Chantilly cream ($40 Monday-Friday, $45 on Saturday, $50 on Sunday). You do need to make a booking two days in advance for a party of at least 10 people. Although I can see why this is requested, I wonder how many high teas they could serve if their rules were not in place. One of the draw cards is that they are consistently holding special events such as New Years' Eve and August's French tribute, Melbourne Cup Day and wine tastings, to renew interest in their menus and generate new business. The next foodie event is for Father's Day. These events are in demand, so tickets go quickly. Sit and watch the sunrise and sunset. Zimzala means 'sand between your toes', which I think they deliver. There are a few details that can spoil an otherwise good dining experience. I'm impressed, however, that they have taken time to amend and improve upon the more negative elements. With the recent appointment of a new Executive Chef, Tod Lawrence, I am interested to see what changes have been made to this foodie heaven. **Cost: Breakfast from $4 and Lunch/Dinner from 30 per person for meal deal. **When: Monday- Sunday- 6am- 4pm, Wednesday- Sunday- dinner service open til late.